My title to last fridays post stated it was Part 1. So, better late than never….here is Part 2. How adorable. I really like the way this MFT Can Ya Dig It? set turned out. Even more, the flap card contains my favorite flower seeds inside, Zinnia:) which a lucky viewer may have the opportunity to get their hands on. DETAILS BELOW!!! Every spring, my son and I start little seedlings inside our home. We start from scratch. He waters them every day. We take them outside on nice weather days. We plant them in early summer. I think it is a nice tradition I have started with him. It has taught him to appreciate my flowers and to STAY OUT OF MY FLOWER BEDS…LOL. Now, I reached 200,000 blog hits a little bit ago and want to reward/show my appreciation. How about this set of cards featured here? Interested? I work all weekend so you have till Monday to leave a quick comment. I’m going to have my little gardener pick a name which I will announce on Monday afternoon. wow! what a wonderful tradition! i would love to be entered for your blog candy! That is very nice tradition. My dad and I used to do that, until I moved thousands of miles away, now he does it by himself and I do it by myself every spring. Oh well…My husband and I are hoping one day to get him in the US, so maybe we’ll continue our tradition. But that aside, I love your cards and all the details! Love these cards. The seed flap card would have been great to send to my uncle. We sent him tomato seeds as they are very expensive to buy in Thailand. Great job! Ohh, ohh!!! Pick me! *waving hand wildly in air* Your cards are gorgeous! I love checking out your blog, and do so often! Thanks for all the inspiration! You are SO TALENTED! Love your work! Congratulations on your 200,000 hits, woww that is a lot!!! I love your blog, your cards, your creations, endless creativity. This is adorable! I would love for you to pick ME! I just got my Can Ya’ Dig It? set yesterday – so cute! Congrats on 200,000 hits! Ohh, you do great work. What a treat to get a blog goody! Thank you for sharing your work! It was well worth the wait! It’s super cute! I’d love to be entered as well. Those are beautiful and my oldest loves to plant flowers and plants. What beautiful cards, I love the idea of putting seeds inside. So very cute, I would love to have them sent to me. I love this set and your samples are adorable. Sorry you have to work this weekend. And I can’t wait to see your Artisan Award submissions. What a sweet thing to do, I should have tried that! Cutting through the flower bed seem like a great idea to my son???? Love your blog! What a treat that would be – I’m crossing my fingers!! I love this tradition. My son is only 1 right now, so this would be so much fun to start. I’m not really into gardening – I wish I was…my mom, my grandmother and my great-grandfather were and the women still are – gardeners. So I’d love to have something like this to share with Dane. Thanks for the idea! Love the seed flap card! Your designs are beautiful, like always! Would love to win this set of cards! Thank you for the opportunity and congrats on 200,000 hits! How cute! My grandma is the best gardener I know, and this card would be so cute for her. I just ordered this set, so you’ve given me some good ideas for it. Thanks! CONGRATS on your milestone hits, MJ! Your cards are beautiful (as always! ), and thanks for sharing your story of your tradition with your son! Absolutely love, love, love all of your creations. I am fairly new to stamping and so everytime I log onto your blog I am just amazed and excited to try everything! Congrats on your many hits! Many compliments on your great cards. I love what you did with the stamp set…awesome idea! I hope I am the lucky winner. Regardless, we all win when we get to see your awesome creations. Congratulations on your hits. These cards are fabulous. I love zinnias, too. What a great idea to get your son involved. Wow! Your work tells the story of your hits. Congrats and keep the inspiration going. I love your blog and cards. Gives me lots to work on. Congratulations on hitting 20K. I love that idea what you do with your son with the seedlings. It’s a wonderful tradition and I hope he continues with that tradition with his future family when he grows up. Your cards are beautiful. Thanks for sharing with us. What a great way to share time with your son! Love the idea of using the flap card as a seed packet, you have such great cards. This card is so beautiful that now I am forced to buy this set and live a life frustrated by my inablity to make such art!!! 🙂 Really like it! Love the tradation and the cards. Congrats on a wonderful blog. Oh, what a nice story! I love planting outside, and these would be perfect! You are so sweet to offer, and to share this story! Awsome tradition! These are the things that make memories to cherish in the later years. This set that you created is awsome! Love that set. 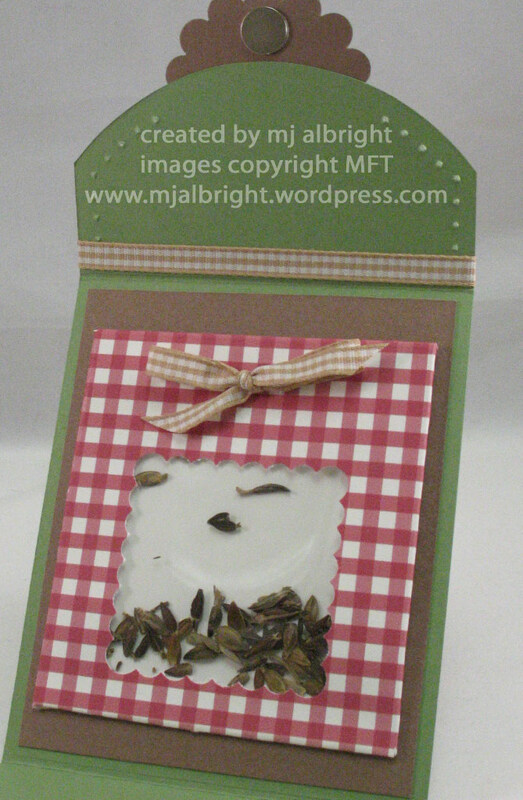 I love your sping planting seed cards — what a great idea for a small gift. Thanks for sharing! What an awesome tradition! This is super cute! Congrats on the hits – it’s cos we love your work so much! Thanks for sharing! So beautiful!!!! I want to get that MFT set too! I’m just lovin’ these creations! Thanks! Never to young to start them loving the feel of dirt and Gods beauty at hand. Love them cards.. They are beautiful. Have a great weekend. What a beautiful set of cards, and what a sweet tradition. You’ll treasure the memories! I can dig it! What a neat project! I’ve been looking for something neat to do for a thank you card. I bet these were really fun to make! Thanks for sharing your idea! The tradition sure sounds like a good one! Perhaps I should have done that with my four kids. It seems that everytime they’re outside playing they run through my flowers or at the very least kick a ball into them. My poor landscape lights have seen better days. Love your card set. It makes me long for warmer days so that I can get out and actually garden. I would love to win these adorable greetings. Pick me, pick me! Great cards! I love the little seed pack inside. Very ingenious! I just love both your gardening cards and really, really, really, want them! I am a big time flower gardener. I have over 2 acres of perennial flower gardens. They keep me very busy. I live in northern wisconsin, and so far spring seems very far away. Even though the calender says it the middle of April, I awoke to fresh snow on the ground again this morning. I am so tired of being cold all the time and would really appreciate an uplifting spring card right about now. The cards are absolutely stunning. And I love the seed idea inside the card. I should make some for my friends. Thanks for the inspiration. I just got my Scor-Pal and really want to make a flap card–so here’s my chance to win an example! So cute. I love to garden, too. When my boys were small, we used to plant a little section of the garden together so they had their own flowers and veggies. That’s a great tradition. When my nephews were younger I’d take them to the garden center and they would pick out flowers to plant in their garden. We would go to each of their houses and we’d help each other plant them. We would also plant sunflower seeds…my favorite…they always enjoyed watching them grow. Great idea for giving away seeds you may have collected to share with others. Both these garden cards are lovely, would love to recieve one of your creations! Wow. Beautiful cards. What an awesome treat! Gorgeous cards!! What a fabulous tradition you’ve started. I just might try that with my kiddos. Thanks! i think a seed packet will fit inside the flap card! That’s a lot of hits! CONGRATS! Love the cards, too. Great work! These are adorable! Congrats on your blog success! I am happy that I was able to help with all those hits! I will continue to add to your total! Thanks for the inspiration!! Wow! 200,000 hits! I can see why though – your work is awesome! My dh and I just recently bought our first home and I have no idea what is planted in the flowerbeds … lol! It will be a big surprise – I would love to start some seeds inside, just in case I have to add something to the flower beds! Im not commenting to enter-I just wanted tot tell you that your set ROCK!! Love your color choices for this. So sweet and “outdoorsy”!! This is adorable! I’m having some girlfriends over for a slumber party (yes, we’re all old ladies, but we still like to have fun). Anyway, I’ve been trying to think of a cute favor gift – and this is it! Thanks so much for th inspiration. These are adorable and my hubby would love the seeds! He has a garden the size of a built-in pool! Guess what I keep asking him to do? You got it…get rid of the garden and put in a pool! Ain’t gonna happen, is his response! Congrats on 200,000 hits! I read all the time! congrats on the hits! That seedling flap card is so great, I love it!! Love your cards and I love visiting your blog on a daily basis. You are very inspirational! Thank you! Love the cards! My little garden “helper” has the complete kitty catkins gardening set complete with gloves. Too cute on an almost 4 year old. Too bad the deer eat everything, including the roses, but it doesn’t stop us from trying and enjoying the experience together. Thanks for sharing your beautiful creations! My sons and I do the very same thing each spring. . . it’s our favorite time of the year! I love your cards. . . . great job! Super cute! I love this stamp set… Anyway congrats on 200,000. I have enjoyed reading your blog and seeing all your creative artwork! I’ld love to have an origanal!!! Love your sketch for Beate! I really want that set…but would I use it enough??? PROBABLY!!! I would be thrilled to get your set. It’s adorable! What a very cute idea. OH how adorable, Mary Jo! What a fantastic set! Would LOVE, LOVE, LOVE the set. Thanks for the chance to win. Also congrats on the 200,00 hits. WOW!!!!!!!! I can see why. Your work is B E A U T I F U L.
Too cute, love the set!! What a great tradition and wonderful lesson you are teaching your son. i think we all forget how truly easy it is to install values and tradition in our children! All of your creations are amazing! MaryJo, these are just adorable. Thanks for the chance to win them. I love looking at your blog regularly for inspriation. It warms my heart to hear about you and your son’s tradition. Thank you for the opportunity to win blog candy! What a wonderful finsh to an already beatiful card. We are having a planting party and this is the perfect “thank you for helping” card. Love this! I so need to try a flap card!! I was wondering when we’d see “part 2” of your challenge. 🙂 So glad to see it and think it’s just adorable! Definitely a good way to keep the kids out of the flower bed as well! What a sweet tradition and adorable card! Love your card! My little 4 yr old grandson planted peppers with me last year and he loved watching them grow. This card is a terrific idea! What a great idea! Who wouldn’t be intrested in an MJ set of cards!! Hope that work went well and that you can rest a bit on Monday! Thanks for awesome ideas and a great blog! I’m a new MFT fan and would love the chance to win your beautiful cards! Love the flap card and congrats on 200, 000 hits! Once again you have amazed me with your cards! Stunning as usual! Love the idea of the seedling tradition…my son is 3 right now, but I am thinking next year we may have to follow suit. My son and I have some sunflowers, zinnia (green envy) and rudbeckias on the windowsill right now. Congrats on your 200K hits, your cards are awesome! Happy gardening to you and your little guy. With Earth Day coming up this post really touched me. I think it is so important to have traditions with our children that have real value. I hope you have inspired your son to become a gardner when he grows up, maybe even a Park Ranger or Naturalist, the possibilties are endless. Beautiful cards, beautiful parenting! Well you did it again. This is right up my alley, I love gardening and belong to 2 garden clubs, this will be a CASE for sure…Thanks for sharing. What beautiful cards! I love the little seed packet inside. Your cards made my fingers itch to get out in the garden.! Apparently no one wants to take these off your hands, so, if you’d like to just get rid of them, I guess you can send them to me…sigh.. Ha!!!! These are beautiful MJ!! This is so awesome! I love how you share your gardening with your son and turn it into a stamp project. You’re my kinda gal! I am a “share cropper” when it comes to my garden and can’t wait to make some of these cards which my son will love to help me with. SO COOL! 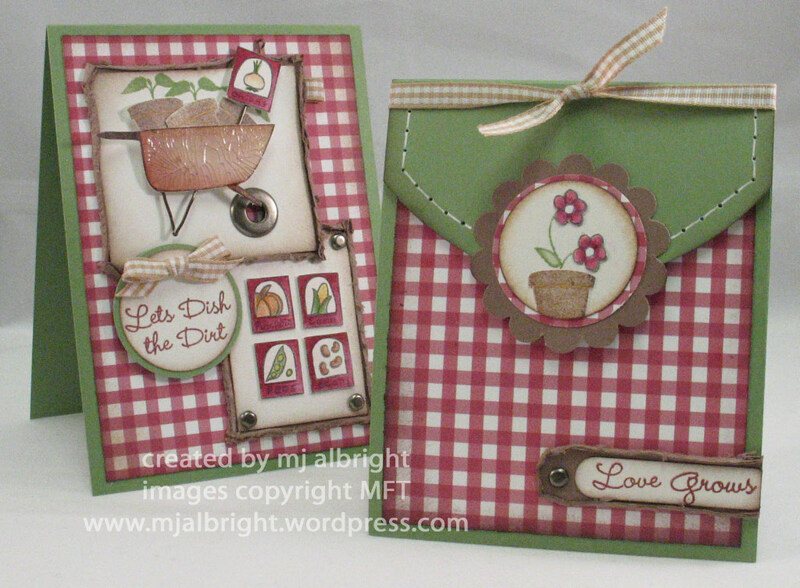 Hi Mary Jo, I just love looking at your blog – gorgeous cards etc. Just love this flap card and your idea of the seeds inside. I cannot be entered for your prize draw as we cannot have seeds come into Australia but just wanted to say how lovely it all is! !